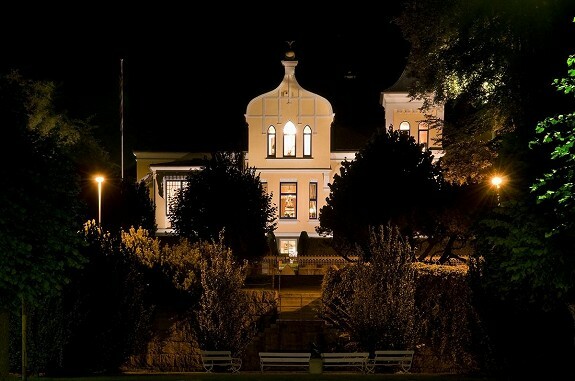 Want to live in a magnificent castle in Halden with a spectacular view over the Oslo Fjord? Read on! On the Norwegian site finn.no (e-bay) is a plethora of properties for sale. The Skomagerslottet (English: Shoe Maker Castle) in Halden stands out as a remarkable castle with a long history. 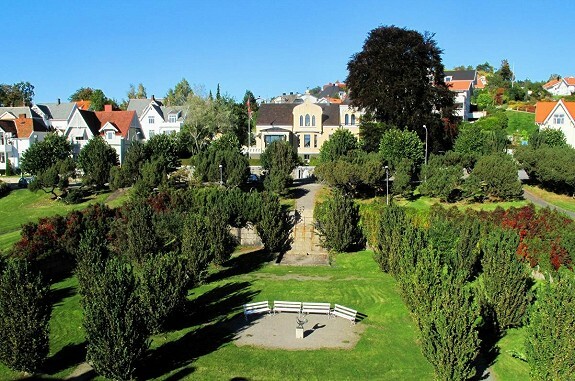 The residence is located in a fashionable and attractive residential area, and the property is at the end of “the avenue” with a view towards the Fredriksten Fortress and the city of Halden. Around the property there is a lovely landscaped garden which includes unique trees, flowers, walkways and fountains. The corner plot measures approximately 15,694 sq.ft. (1,458 sqm). 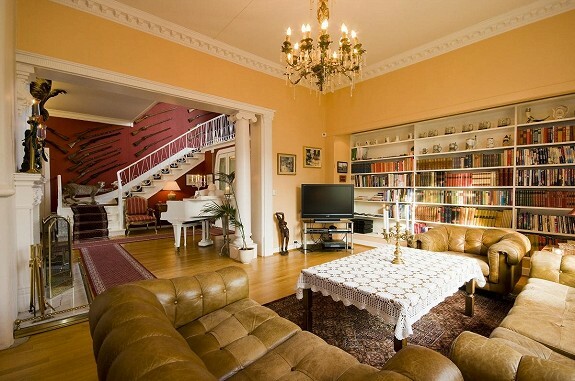 The residence has very good standard and is well maintained. The special character is well-preserved in the interaction between old and new material. Live Like a Count This stunning property has a lot of history and soul. On both sides of the avenue are tightly organized houses. Along with Skomagerslottet and a former shoe factory nearby, a typical residential hierarchical pattern is formed. This organization was common in the early 1900s, and is considered to be the Norwegian variant of the British garden city movement. 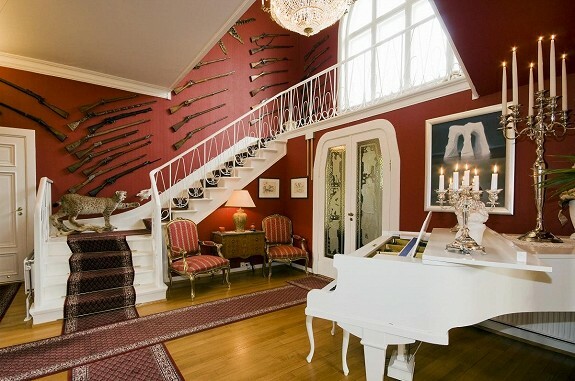 Skomagerslottet was built in 1911 by architect Albert Wille, and is characterized as an Art Nouveau villa with a certain ‘touch’ of medieval style. As a young man, Wille (born 1881- died 1966) worked as a bricklayer in Halden. In the early 1900s, he took a degree in architecture in Germany, where his father originally came from. 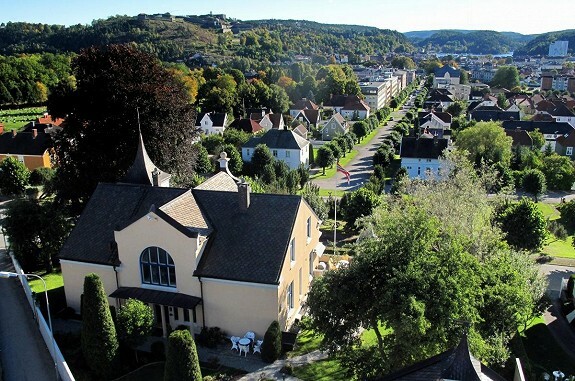 He established an independent architectural business in his native town Halden around 1905. His earliest work was most influenced by neo-Renaissance, but Wille stood out the most as an Art Nouveau architect. The so-called Skomagerslottet with an Art Nouveau and medieval feel is one of his finest works. Beyond the 1900s, he was more affected by functionalism. Ground floor: Porch, hall, 2 offices, archives, WC, utility room, hallway, storage. First floor: Porch, WC, hall with staircase, kitchen, 3 living rooms, summer garden with access to the veranda, shower room with WC. Second floor: Pool room, 4 bedrooms, hallway, bathroom, storage. At its most, Halden had 17 shoe factories between 1892 and 1998. Throughout the 1950s, the city’s 800 footwear employees produced 800 000 pairs of shoes annually. That meant that every fifth Norwegian shoe was produced in Halden. Until the 1960s, Halden was considered the capital of Norwegian footwear. The first owner of Skomagerslottet, Johannes Carlsson, was the first who established a shoe factory in Halden. It was founded in 1892 under the name Halden Skotøifabrik (Halden Shoe Factory), and had 250 employees when they went out of business in 1936. During the war years between 1940 and 1945, shoes were made out of cardboard, paper and fish skin. Most shoes were labeled: “This shoe has no guarantees”. Østfold Shoe Factory, established in 1920, was the largest factory in Halden. In 1964, they produced 136,400 pairs of ladies’ shoes, moccasins and orthopedic shoes. The company was closed down in 1968. Halden last shoe factory, Casko Shoe Factory, was discontinued in the late 1990s.